It was 5:30 p.m. on a Friday night many years ago. I had ducked into my office and closed the door at 4:30 because I knew my boss would be trolling the halls looking for someone to keep him company on his weekend labors. He had no life to speak of. I did. Unfortunately, I was still a half-hour commute from that life. I emerged, hoping he’d given up and gone home—he had—only to see three colleagues doing the same. Home would wait a bit longer. It was time for a beer and, perhaps, a bite. That is an Americanized version of the attraction of the yakitori tradition: co-workers emerging from the bowels of the machine, seeking an antidote to the long hours of the week and finding it in grilled chicken skewers and libations. 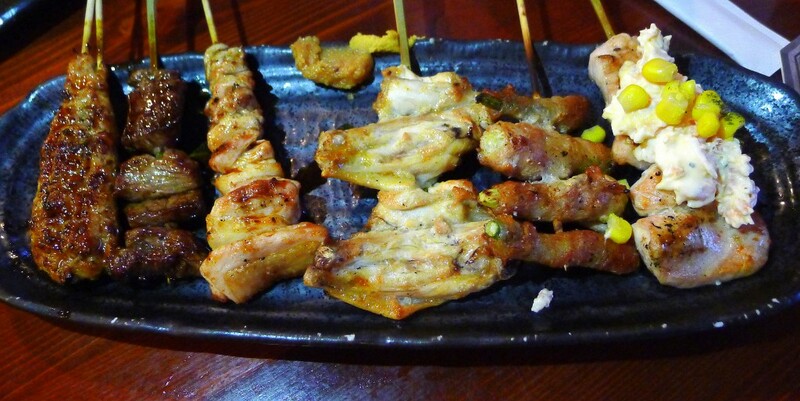 “Yakitori” translates literally as “grilled fowl.” It’s basically bite-size chunks of chicken grilled on skewers. The chunks range from pieces of thigh or breast to offal and meatballs. Beef, pork, tofu and vegetables also make appearances, many basted in tare, a sauce made from mirin, sake, soy sauce and sugar. Tare pots are never emptied; chefs just add to them over the years, the flavor deepening over time. The classic fuel for yakitori is high-quality lump oak charcoal called binchōtan, which burns at a lower (not, as is often said, higher) temperature for longer than ordinary charcoal. It is cooler and cleaner, producing neither flame nor smoke. While the origins of yakitori date back to the 1600s, it took root during the early 20th century and exploded in popularity in the 1960s. Yakitori stalls and restaurants at which the skewers were grilled in front of the customer (yakitori-ya), lined Tokyo’s streets. The grilled skewers became increasingly inseparable from their alcoholic accompaniments. Yokohama Yakitori Koubou (3904 Convoy St. in Kearny Mesa) does an excellent local take on yakitori, perfectly capturing the essential, casual vibe of the yakitori-ya. An excellent way to start at Koubou is to order the six-skewer omakase. On one visit, ours included chicken meatball, beef tongue, chicken thigh, chicken wing, bacon-wrapped asparagus and chicken breast with a mayonnaise-salmon and corn sauce. The latter was downright strange. The rest were excellent, with the beef tongue a particular standout: thick-cut and yet tender with a kiss of the tare. Yakitori joints use all parts of the chicken and excel at making some of the less-fancied cuts delicious. Koubou’s livers are crispy on the outside, deeply creamy inside. Hearts and gizzards taste much better than one might suspect. The skin exceeds lofty expectations. One of the more adventurous choices is the chicken nakaochi, bits of the bird’s neck bathed in the tare. It’s a multilayered splendor, bits of lean meat and fat mingling with the sauce and combining to be greater than the sum of its parts. I still see that boss from time to time Downtown. While the rituals of dodging him on a Friday afternoon did not directly lead to me finding yakitori, they certainly helped me appreciate it when I did. Regardless, I have found Yokohama Yakitori Koubou now.